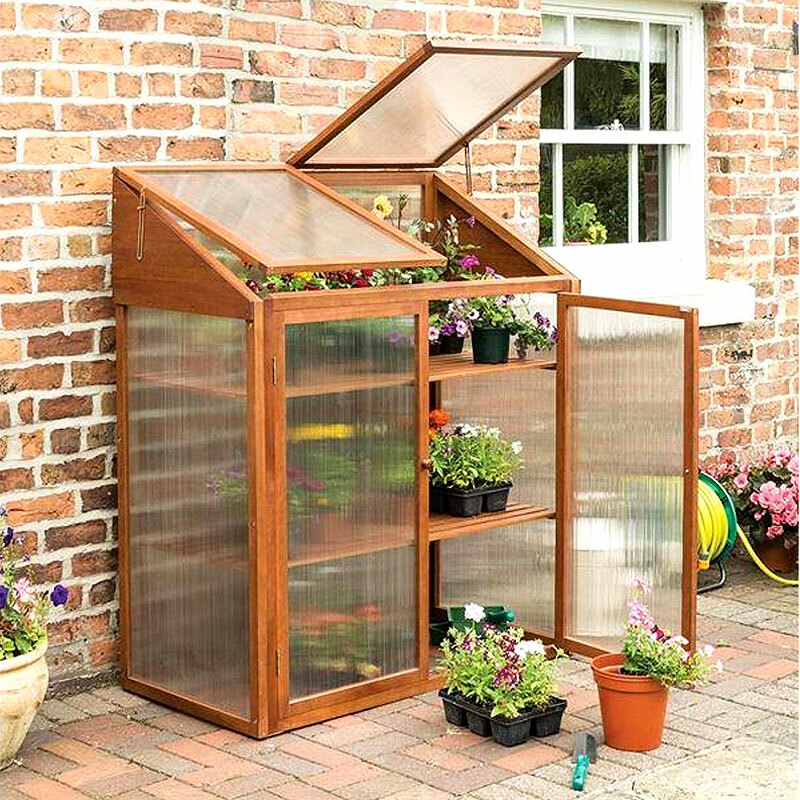 This Rowlinson FSC Hardwood Mini Greenhouse provides you with a compact greenhouse that will give you the maximum growing space in a stylish and elegant package. 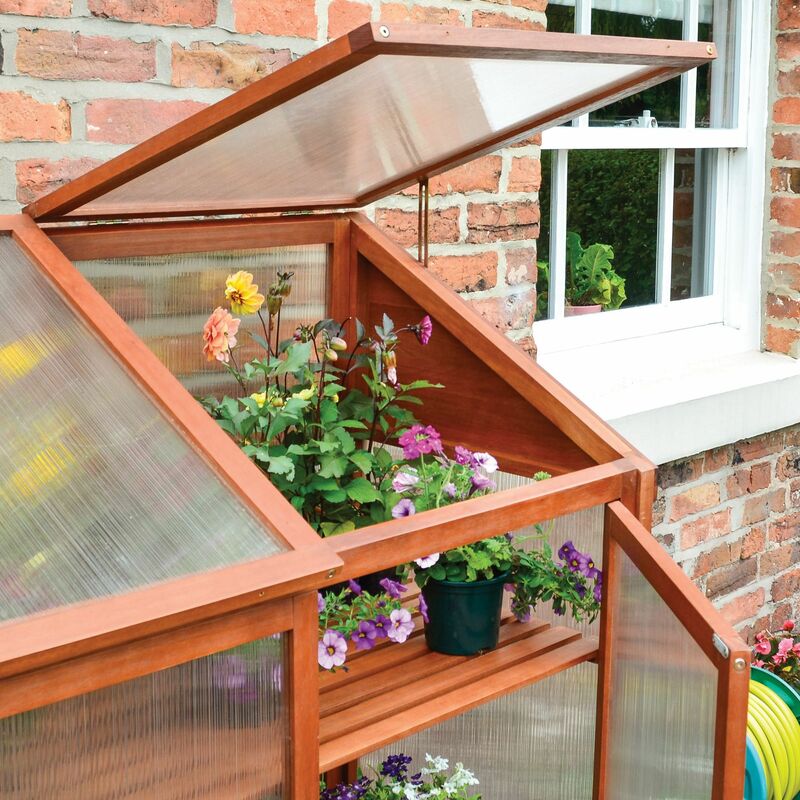 Constructed from hardwood, this greenhouse will give you many seasons of growing pleasure. The wood itself is FSC certified timber which has been sourced from responsibly managed forests. This sturdy construction comes in a natural finish that has been planed smooth, for safety and aesthetics. Clear twin wall polycarbonate glazing is used, as it is light, strong, family safe, and is virtually unbreakable. 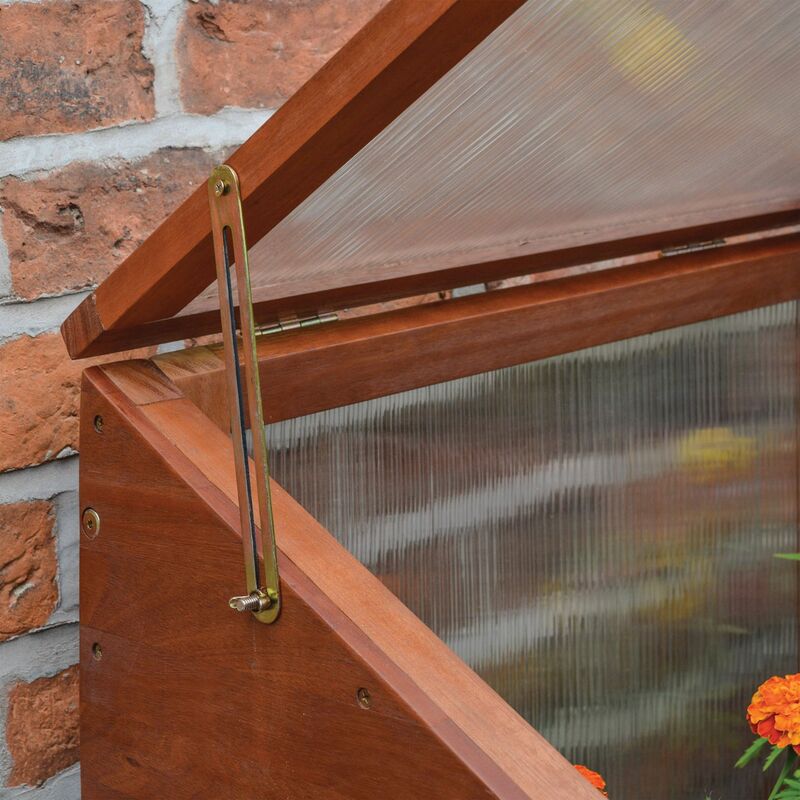 The glazing provides excellent light transmission while the design helps to diffuse the sunlight, helping to reduce any scorching any tender plants may be susceptible to. 2 x Lifting lids with lid stays and adjustable height settings. 2 x Shelves for storage. 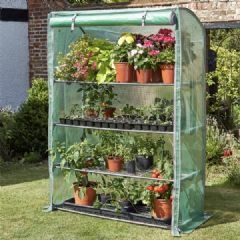 This flexible mini greenhouse comes complete with two independently opening doors, as well as two hinged roof lids which come with height adjustable stays, meaning that keeping an optimum temperature is simple. 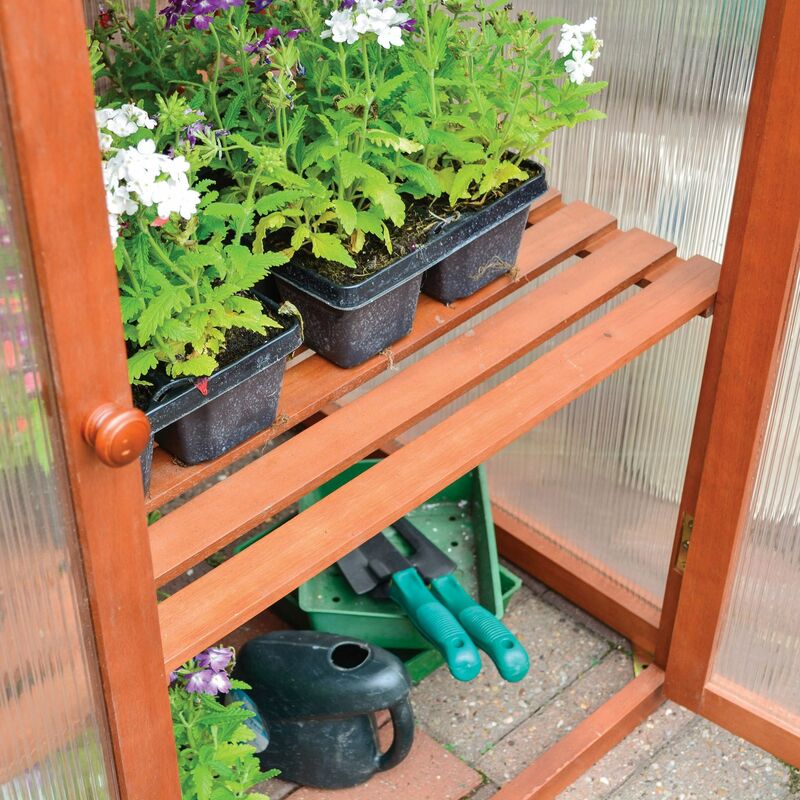 Two levels of shelving are included to allow you the maximum space when it comes to growing, and storing your seedlings. The base has been designed so that it can accommodate extra plants, or equipment, giving you real flexibility. 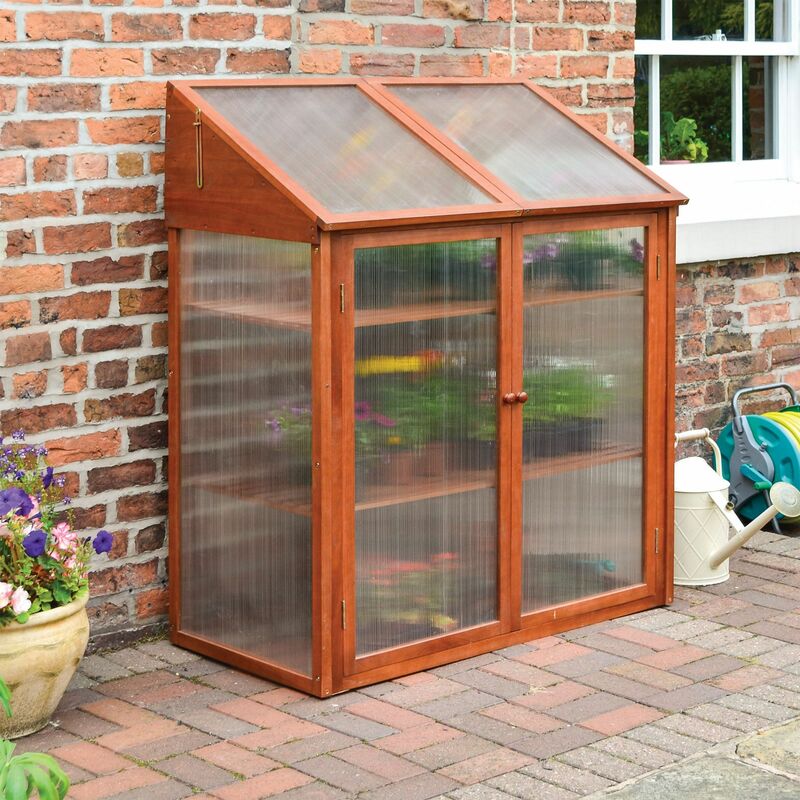 The beauty of this Rowlinson FSC Hardwood Mini Greenhouse is that it is small enough to fit in most gardens or on patios and decking areas. 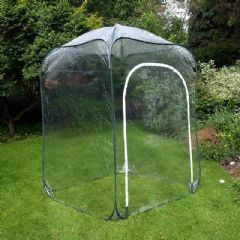 Customer note: This greenhouse does have a polycarbonate back panel. It is not a lean-to greenhouse. This item comes flat packed, and some assembly will be required. A good product that assembled easily. It is well made and sturdy. 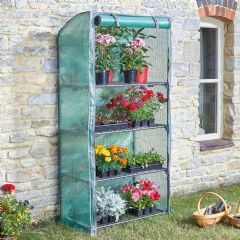 A really good accessory for my glasshouse. I am very pleased with it. I'm very pleased with this. It arrived early, it was well packaged, it was easy to assemble (1 person with some help from a second at certain points), it seems robust and looks smart. This mini greenhouse is ideal for my small garden. Well made and easy to put together and sturdy but have attached it to wooden battens onto a garden wall - just in case of high winds as we live on the coast. Very pleased. The greenhouse was put together by two people in less than an hour. It is sturdy and strong and despite the heavy frosts it has protected my young plants. Worth the wait really pleased with it! The mini greenhouse is very well joinered in stained hard wood. I singlehandedly constructed the greenhouse in two hours aided by the easy to follow pictorial instructions. Extremely efficient ordering service by Greenfingers Trading Ltd was backed up by a most prompt delivery which arrived at 8.30 am on the day specified. Highly recommended. 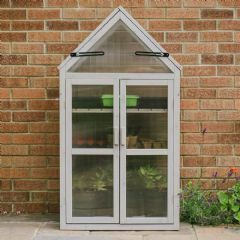 This mini-greenhouse is easy to construct, good to look at and I think will be user friendly as the shelves are adjustable and the doors and roof lights are easy to open and close. It's been so hot I haven't had to use it yet, but when I've opened it to let the air circulate it smells like a sauna because of the lovely wood it's made of! I couldn't be happier with it, and such good value too. Well made and easy to assemble. Had it for one week when asked for review. A great addition to my garden; needed two of us to put it together, but seems a very good quality product.